James Bailey, Chief Executive of Henry & James, writes about the opening of “Embassy Quarter” in Nine Elms and how this will create new opportunities as embassies leave Belgrave Square. It is famous the world over for its architectural beauty, history and multi-million-pound price tags. Downton Abbey was filmed there and it even played a key role as a tank park in World War II. Now it looks as if there is going to be another major transformation of the magnificent masterpiece built by Thomas Cubitt. The opening of the new American Embassy in Nine Elms, Battersea, later this year will not just create a major new diplomatic enclave south of the river, but lead, inevitably, to a shake-up in the bastions of the London diplomatic communities, including Belgrave Square and other parts of central London. Countries great and small are getting wise to the fact that they are sitting on property gold mines – and that they can shift the location of their London embassy by just a few miles and raise tens of millions of pounds. London is such an organic city that major changes in one area invariably have knock-on effects in other neighbourhoods. The old Brazilian Embassy in Green Street, Mayfair, London went on the market in 2013, it fetched £40 million. Other embassies could expect to do much, much better. And with America leading the way, the old bias against diplomatic missions ‘on the wrong side of the river’ has been a major wake up call. The Dutch Embassy in Hyde Park Gate is already in the process of relocating to Nine Elms, and the Chinese Embassy in Mayfair is reportedly considering a similar move. Very soon the new ‘Embassy Quarter’ in Nine Elms could become a magnet for other embassies, including the numerous embassies currently located in and around Belgrave Square. This in turn should create exciting opportunities for buyers and developers alike, making the square more residential. As befits an area where every other person you bump into is a diplomat, discretion is the guiding principle of the micro-property market in Belgrave Square. Properties do occasionally change hands, but they are almost always sold off-market. I currently know of four properties that are up for sale, though not officially. Others will surely follow – with intriguing repercussions for Belgrave Square itself. One of the potential opportunities of the famous old square is that there are very few residential apartments. It is predominantly made up of large single residences – many of them embassies or high commissions. Germany, Spain, Turkey, Norway, Austria, Malaysia and Portugal are just some of the countries that have their embassies on the square. The price tag on most of the properties would be in the tens of millions of pounds, if they were ever to come on the market. But as the old adage goes: “if you have to ask the price, then you probably can’t afford it.” In 2016, Eaton Square nearby was named as Britain’s most expensive address, with the average house price just shy of £17m. And Belgrave Square is, if anything, even more architecturally impressive. The corner sites, in particular, must be among the most valuable pieces of real estate in Europe. If the embassies sell the corner properties (the grand detached houses on the square) would be irreplaceable. Against that background, I strongly suspect that, if and when any of the current embassies in Belgrave Square are sold, they will most likely be converted into high-end apartments, bringing a new exciting wave of buyers to the area. And, as Belgravia continues to re-invent itself, the one-time stomping-ground of diplomats will enjoy a renaissance as a more diverse, more vibrant residential community. In fact, it is not too fanciful to speculate that, by 2025, the square could be acknowledged as London’s number one address. It could become even more highly-regarded than Eaton Square. 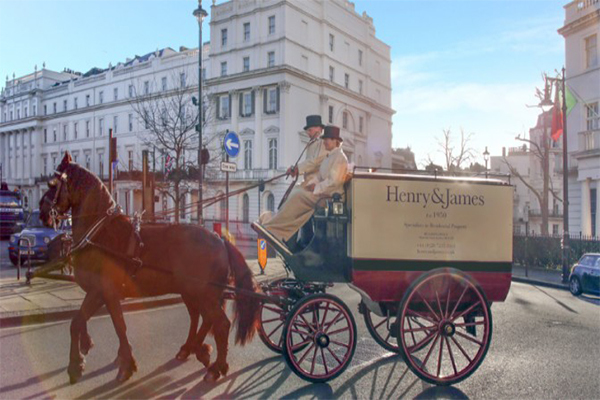 James Bailey is the Chief Executive of Henry & James, Belgravia and Chelsea’s premier estate agent for residential sales and lettings (henryandjames.co.uk).